Does Medicare Cover Chair Lifts for Stairs? Older people or individuals experiencing difficulties in moving up/down the stairs without aid can easily make use of a stairlift. It is usually combined with a wheelchair ramp, which helps aged individuals move freely around their homes without anyone’s assistance. Although it might not be easy to stipulate an exact price for a stairlift and the home modifications, it is quite high. 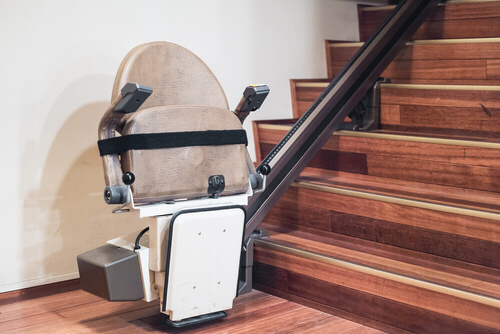 It’s no doubt that modifying your stairs with a stairlift comes with a lot of benefits. However, the price becomes a real issue for people who need the mobility device. A stairlift and wheelchair ramp are designed specially to promote physical well-being and easy locomotion. But with it being so pricey, you’re probably wondering if you can get funding for such a device. Well, there is a way to obtain the mobility device, provided you know the right places to look. Can Medicare Cover a Stairlift? What pops up first on most people’s mind is getting Medicare to cover all the expenses that come with getting a chair lift for stairs. This is a common question we get when people are checking insurance options. The sad news is that Medicare won’t be able to cover these costs. The reason for Medicare not covering the cost of mobility devices isn’t farfetched. Medicare regards the stairlift and wheelchair ramp as home modifications and not durable medical equipment. You may or may not agree with the Medicare perspective of mobility devices, but they have the final word. Do not be bothered, just because Medicare can’t cover all the expenses for your chair lift for stairs, it doesn’t mean it is all over. There are other funding opportunities you can get. Medicaid — you can get Medicaid coverage for stairlift and wheelchair ramp expenses, provided the mobility devices are of utmost necessity to aid aged individuals to regain their independence. To know if you are qualified for the funding, you will have to fill out an application form. Seeking out financing for any home modifications, which will result in helping a senior living alone to remain safe, requires the Home and Community-Based Services form. For Veterans alone – those who have served in the military and need coverage for home modifications should visit the Veterans Administration. They have several funding options open to Veterans alone. If the need for stairlifts and wheelchair ramps is a result of your services in the military, this institution may cover all the expenses for your home modifications. If you are 65 and older and would like to inquire about whether or not your Medicare plan covers a stair lift, please be sure to contact a BGA insurance agent. This is a free service for seniors to get their questions answered.